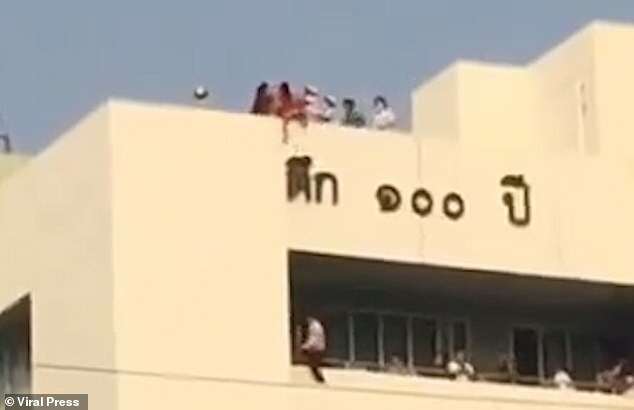 A four-year-old girl who plunged from a hospital rooftop in Thailand was saved when her dress snagged on lettering on the side of the building. 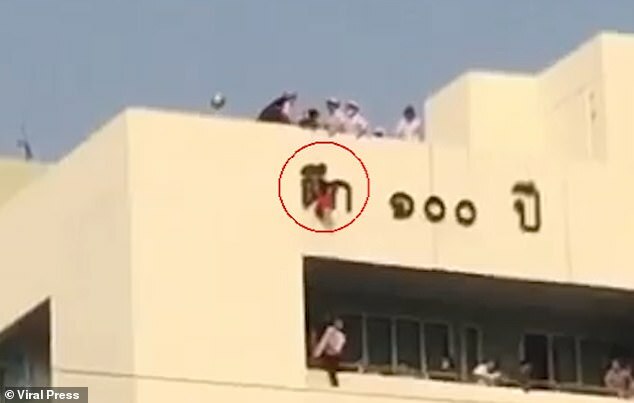 The toddler was hauled to safety after her loose-fitting red dress became caught on the first letter of the Thai alphabet – tortao – on a sign showing the name of the hospital. She accompanied her father for his treatment but wandered away from the ward at the Paholpolpayuhasena Hospital in Kanchanaburi, central Thailand on Sunday afternoon. She then pushed through a fire escape door and climbed the stairs before running onto the roof of the seven-storey building, where she began chasing a small gecko. The Burmese youngster, who has not been named, said she was following the lizard when she climbed over the side of the building and dropped below. A guest called the hospital staff after he heard a child screaming outside the window. 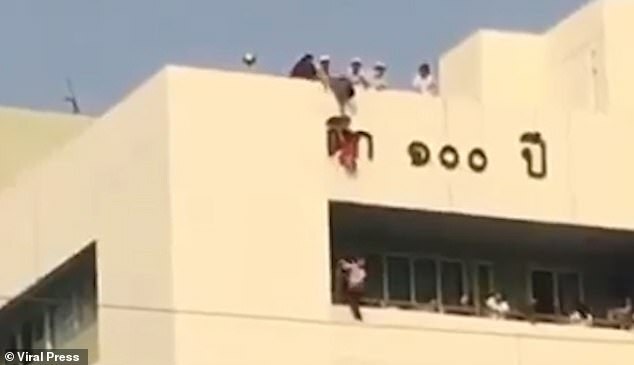 Six nurses then rushed to the roof and were shocked to find the girl hanging in midair. Incredibly, the women managed to reach down and rescue the girl, who was also clinging on with her hands to the large letter. One brave nurse climbed down to grab the girl’s hand while others held onto her body. A bystander on the floor below stood on the balcony prepared to try and catch the girl if she fell. The four-year-old was eventually carried safely away from the scene, but was said to be in shock from the incident. Her father said he was being treated in a patient room located on the seventh floor while his daughter was playing on the ward. He said he became concerned after noticing she had disappeared for a long time. Somjed Laoluekead, the director Paholpolpayuhasena Hospital, said: ‘We took the girl for a physical check-up and found no serious injuries. She only had bruises and scratches.